Eldecalcitol is an analog of the active form of vitamin D3, with stronger effects than the native form in increasing bone mineral density (BMD) and reducing bone resorption in patients suffering from osteoporosis. Dr.Hideo Saito's experiments show that eldecalcitol is expected to be beneficial for the maintenance and improvement of muscle function in elderly individuals. 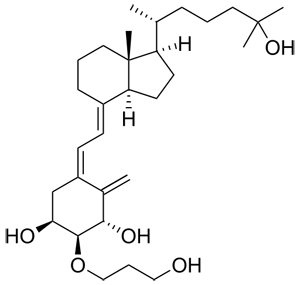 Systematic Name: (1R,2R,3R,5Z)-5-[(2E)-2-[(1R,3aS,7aR)-1-[(2R)-6-hydroxy-6-methylheptan-2-yl]-7a-methyl-2,3,3a,5,6,7-hexahydro-1H-inden-4-ylidene]ethylidene]-2-(3-hydroxypropoxy)-4-methylidenecyclohexane-1,3-diol Inventory Normally we have Eldecalcitol in stock. 1. A vitamin D analogue, eldecalcitol, enhances expression of fast myosin heavy chain subtypes in differentiated C2C12 myoblasts. Orthop Sci 2017 Mar 23;22(2):345-350. Epub 2016 Dec 23.